Sketch of Frying-Pan Shoals and Cape Fear River. 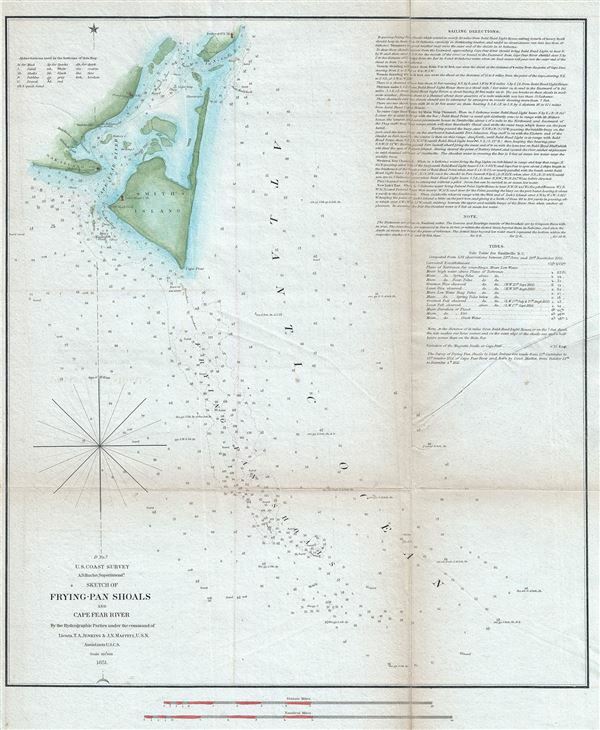 This is a fine 1851 U. S. Coast Survey's nautical chart of the Frying Pan Shoals and Cape Fear River in North Carolina. It covers from Federal Lighthouse on the southern tip of Pleasure Island south past Smiths Island to the Frying Pan Shoals in the Atlantic Ocean. Includes parts of Oak Island. The Frying Pan Shoals cover a large area and are strewn with a number of shipwrecks. The chart includes notes on tides and detailed sailing instructions and other useful information for the mariner. Countless depth soundings are noted throughout. This chart was prepared by T. A. Jenkins and J. N. Maffitt under the supervision of A. D. Bache, one of the most influential and prolific Superintendents of the Coast Survey, and issued in the 1851 edition of the Superintendent's Report.